For the banjo player, there are various styles that you can learn to play, such as old time banjo, claw hammer or five-string three finger picking. If you choose five-string picking style, then you must learn to roll and roll and roll with the right hand, until you are blue in the face or your fingers hurt. The chord structure is not as complicated as the guitar but the scale structure is not as clearly delineated on the fingerboard either. Banjo players want to play fast right out of the gate but if you don’t learn to slow down and master the right hand and left hand technique, then you will soon become frustrated when playing a song. The banjoist must also learn back-up technique as well, which includes vamping the chords to create a percussion sound. A guitar is quite a diverse instrument. There are acoustic, electric and nylon string classical guitars. The width of the neck varies, based on the type of guitar you purchase. Do you want to finger-pick or flat-pick the instrument? Is your preference to play blues, rock and roll, country or bluegrass? The guitar is an important rhythm instrument, so learning how to strum and change chords is vital for you to become proficient as a rhythm player. Chord structure is more complicated than the banjo, and mandolin, since you have more strings to play and thus, more chord forms. Don’t forget that one day you may hope to play lead guitar like Tony Rice or Eric Clapton or Lee Ritenour (depending on your preferred genre). 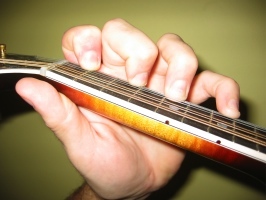 Learning scales around the fingerboard is essential to becoming a great lead guitarist. A mandolin is a tiny instrument but don’t let the size fool you. Tiny does not equate to easier to play. The mandolin has various right and left hand techniques that you will also learn if you play guitar or banjo, yet they may be more prevalent in some cases. The terms tremolo, cross-picking and chops should ring a bell for a seasoned mandolin player. You must practice these techniques regularly, in order to master them. The mandolin scale structure (depending on the key of the song) is nicely laid out and may be more simplified on the fingerboard but many of the chords are not easy to play. 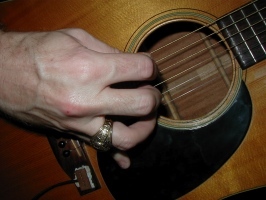 Quite the contrary, a mandolin player has to hold down double strings with each finger. The frets are narrow and there is little room for large fingers. Yet, tiny fingers also create a different problem, since the finger tips have to hold down the double strings at the same time. The mandolin is also a diverse instrument with a broad following that spans the globe. A mandolin player may be heard playing classical, celtic, Irish, bluegrass, jazz and other styles of music. So what is your choice and can you play more than one instrument? At the risk of sounding condescending, if someone is looking for an easy instrument to play, then maybe they should start out with a kazoo. The bottom line is that there is no such thing as an easy instrument. Music itself it not simple and one just needs to study the musical language and music theory principles to understand how complicated it can become. As the great Mr. BB King once said, you will get out of your instrument what you put into it. The sky is the limit. The harder you practice, the better you will become. So yes, it is possible to learn and play more than one instrument, as long as you dedicate the hours towards practicing and learning each instrument. This entry was posted in Banjo, Guitar, Mandolin and tagged Banjo, fretted instruments, Guitar, Mandolin. Bookmark the permalink. 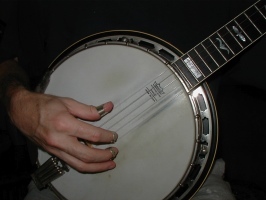 13 Responses to Banjo, Guitar, Mandolin – Which is the Easiest to Play? I’ve been taking guitar lessons for a little over a year and I just started with the mandolin about a month ago. I find that for me it’s easier to play the leads on the mandolin and the chords on the guitar …..this comes from novice me! However I do play a mean KAZOO! My friends and I used to drive down to New Orleans from LSU especially during Mardi Gras and we all would play the Kazzoo down the French Quarters! What fun! Wish the guitar and mandolin were that easy. Unfortunately (or perhaps fortunately), I have learned that almost nothing worth doing is easy. I’ve been taking guitar lessons for about 2 or 3 months and it has so far been one revelation after another about myself and about the music. Learning about chords and music theory is something that I never expected to be excited about, but I am. Sometimes I can’t wait to practice. Sometimes I feel pretty frustrated when I can’t seem to get a chord change or a melody line right. I guess what’s good is that I keep coming back. I think I will be thankful for that one day. I play guitar, mandolin and banjo. I have played the guitar longer and so am better on it of the 3 instruments. I find the banjo the most difficult, earlier in my life I actually quit in frustration. Now that I am older (and maybe have more time and am probably more patient) I find I can play the banjo and am having a lot of fun with it. For me the mandolin strings are harder to push down and when I first started chording found it very difficult. Also the finger spreads are much greater on the mando. Really, I love them all. I picked up the mando and banjo because EVERYBODY plays the guitar so I can bring a different instrument to gigs now. The guitar and mandolin are more similar for the right hand. Mando is sure easier to carry around. Practice, practice, practice! I always play at least 1 hour every day, and on weekends when the honey-does are done I’ll play for hours. I find it harder to play the D chord on my Martin guitar, I put new strings on yesterday and found the first four frets have grooves into them. I guess my guitar is starting to show some wear from all the practicing I have done. I will be attending the Martin company annual picnic, on august 5th I will have the Martin company look at it and repair it at that time. My son came for a visit and brought with him, his guitar. I find playing his guitar is much easier than playing my guitar. The strings on his guitar are much closer to the frets than on my guitar, I think it is called the action. You will probably be best at the instrument you enjoy most hearing yourself play. I have found mandolin easy to jump to, since I’ve spent a lot of time with 12-string guitar, and have been playing violin/fiddle since I was a child (violin tuning is the same as mandolin). So don’t ask which is easiest, but which you’ll enjoy the most. Guitar often brings great enjoyment to people who usually play alone, but if you play with others regularly, you’ll really benefit from having an instrument that everyone else isn’t playing. The kazoo’s not as easy at you think! The dulcimer in DAD tuning is the easiest stringed instrument to learn to play. Get a Mel Bay book and you will be playing songs within twenty minutes. Hey There. I discovered your blog the usage off msn. That is a really well written article. awesome! total new b here, starting with guitar……and go from there. goal is to jam some bluegrass. I love metal, but want to play bluegrass 🙂 thanks for the tips, taking the to heart! “The guitar is the easiest instrument to play…badly.” — some wise guy. I switched from a classical guitar to a mandolin due to hand arthritis–one more problem we “mature” gentlemen must face. The neck is smaller and thus easier to fret, though I’m not used to playing with a pick. Even easier is a ukulele strung with Aquila strings designed for G-D-A-E mandolin tuning on the uke. Easier than double steels to fret (and tune! ), and more comfortable for finger-pickin’.